East Coast Chair & Barstool is coming to the Sunshine State this September! 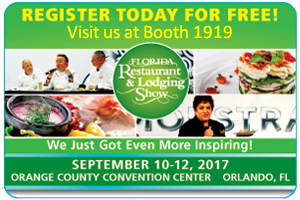 We’re so excited to return to the Florida Restaurant & Lodging Show (FLRS) this year at the Orange County Convention Center. 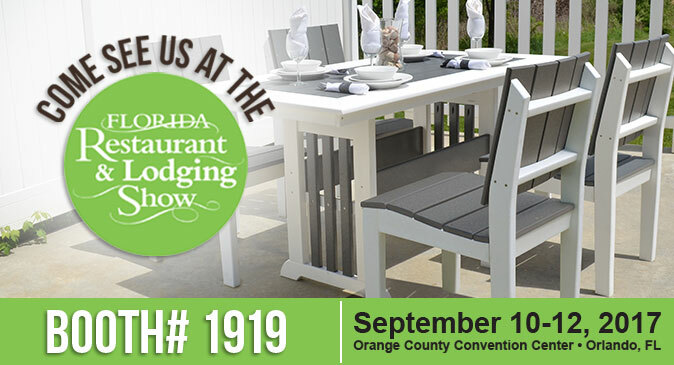 And we’re back with an even bigger booth from last year, which means we’re bringing lots of new indoor and outdoor furniture collections to help your restaurant stand out. 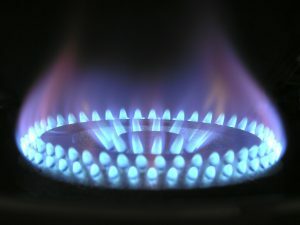 The FRLS show runs September 10 through the 12th and is open to members of the restaurant and foodservice industries. With over 400 vendors, the FRLS show offers restaurant, bar, and hospitality professionals a chance to see industry trends up close and personal. 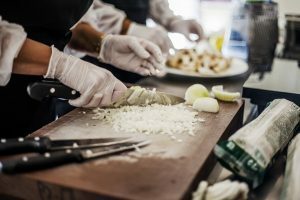 In addition to interactive booths, attendees also can experience educational forums, culinary competitions, and demonstrations by celebrity chefs Letty Alvarez and Art Smith. We will be featuring our luxury bucket bar stools and Quarter Sawn table tops for your indoor dining needs as well as our customizable outdoor Caribbean and Lake Shore Collections, never before seen in Orlando. It’s going to be a show you don’t want to miss! Heading to Florida as well? Plan your visit to the trade show with the exhibitor map and list. You can even click the banner below to attend the show for free. Don’t forget to stop by Booth #1919 and say hello! Everything has a story, but some are deeper than others. Imagine as a man approaches a tree in the forest. He examines it for termites and any other imperfections. Finding none he begins to work on the tree, sawing back and forth until finally, it falls. The tree is then transported to a lumber mill where it is cut into various sizes to be sold. Another man purchases the lumber and uses it to construct a barn that will be in his family for generations. It houses the animals that are his livelihood until he hands the farm over to his children, who then give it to their children. Each year the wood becomes more and more weathered until the barn is no longer able to be used. It is carefully deconstructed to salvage any reusable lumber. That lumber is then taken to a kiln where it is dried and nails and bolts are removed from the wood. Next, the lumber ends up in the hands of an Amish craftsman. He checks each piece for imperfections, before sanding and sealing each board into a table top. Finally, the finished tables are shipped to a restaurant where they can be utilized and enjoyed for years to come. 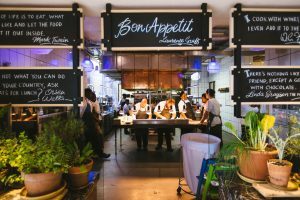 More and more restaurants are looking towards creating a one of a kind atmosphere for their guests to experience. What is more unique than a table top unlike any other? No two of our reclaimed wood table tops are alike; each has varying grain patterns and knots that tell the woods story throughout the years. The boards used to create these table tops are salvaged from Pennsylvania and Ohio barns, making each table different from the one next to it. A great way to customize these table tops even further is by selecting one of our three finish options: natural reclaimed, antique black, and whitewash. Each table top is fully sanded before the finish is added and then sealed with a heavy catalyzed lacquer sealer to make sure they are ready for commercial use. 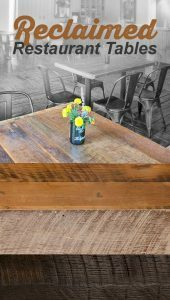 Our most popular option, the natural reclaimed finish allows your table’s raw beauty to shine through. Sanded and then sealed with a heavy sealer, this finish provides customers a look into how the boards may have appeared when they were still fulfilling their original purpose as part of a barn. 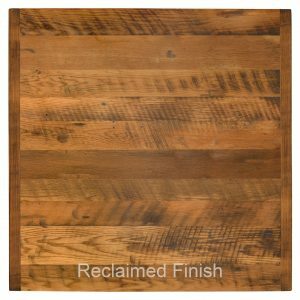 For an organic, classic rustic look the natural reclaimed finish is a great option. This finish is versatile in that it can easily be paired with many of our seating options to create a different look. A new choice available for reclaimed table tops is our antique black finish. 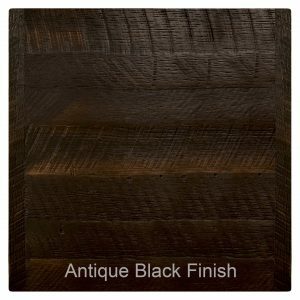 This darker cousin to our natural reclaimed finish has a rich black color that accents the wood grain and helps to draw your focus on the weathered appearance. The table is not entirely black but allows just enough of the original color to shine through to highlight the deep tones of the finish. This finish would look great in any restaurant looking to create a romantic atmosphere. 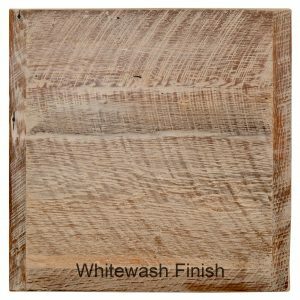 Our final stain option is the whitewash finish. The white coloring adds some light to the table top and accentuates the unique grain patterns without hiding the knots that can be still be seen underneath the finish. Perfect for brightening up a room, the whitewash finish would look great in a bakery or a cute breakfast spot with a colored centerpiece. No matter what finish you select, all table tops are 1 ¾” thick and are available in all 32 sizes that we offer. The tables are available in both round and square options with a steel inlay option is available for square tables only. To purchase your table top in your choice of stain head over to our Reclaimed Barn Wood Table Tops page and start shopping! If you would like to save this article for later on Pinterest, here is a graphic!